Held at the Gold Coast’s eclectic Miami Marketta, guests were treated to a street food menu, live bands and unfettered access to members of the Genie global leadership team including Genie President, Terex Aerial Work Platforms (AWP) Matt Fearon and Genie Vice President and General Manager, Asia Pacific, Terex AWP, Jim Barr. Notwithstanding the heavyweight corporate line-up, a one-of-akind Genie scissor lift also stole the show. As part of the Genie 50th year initiative, a 10-year old Genie GS™-4390 RT scissor lift, painted in celebratory gold, was rebuilt by a large number of the Genie team, led by Genie National Operations Manager, Terex AWP, Mitch Ely. “This gold-painted beauty, which comes with a highly-charged 4.4 litre V8 engine, helped to display the full thrust of Genie 360 Support, the end-to-end customer solution, to the hundreds of guests who attended the appreciation night,” said Genie General Manager Australia, Terex AWP, Brad Lawrence said. “Genie 360 Support is the foundation of our new three year plan. The plan will only be successful if it is embraced by our customers. 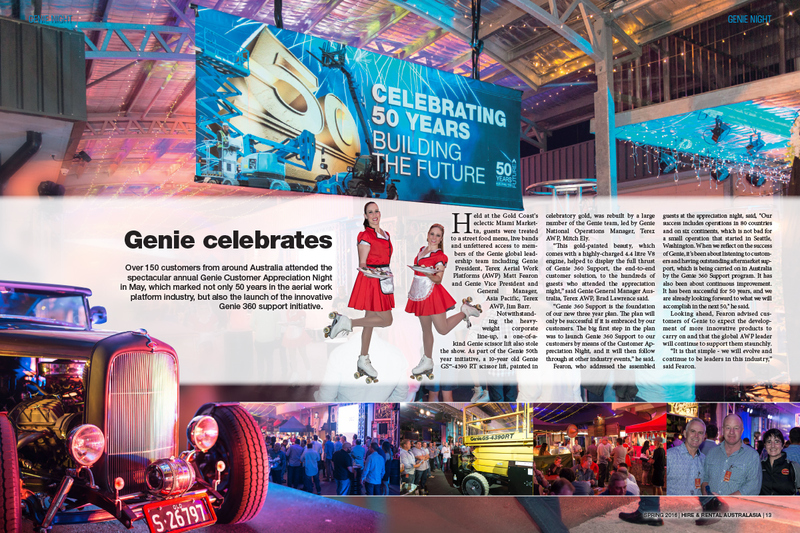 The big first step in the plan was to launch Genie 360 Support to our customers by means of the Customer Appreciation Night, and it will then follow through at other industry events,” he said. Fearon, who addressed the assembled guests at the appreciation night, said, “Our success includes operations in 80 countries and on six continents, which is not bad for a small operation that started in Seattle, Washington. 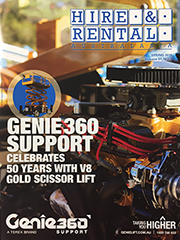 When we reflect on the success of Genie, it’s been about listening to customers and having outstanding aftermarket support, which is being carried on in Australia by the Genie 360 Support program. It has also been about continuous improvement. It has been successful for 50 years, and we are already looking forward to what we will accomplish in the next 50,” he said. Looking ahead, Fearon advised customers of Genie to expect the development of more innovative products to carry on and that the global AWP leader will continue to support them staunchly. “It is that simple - we will evolve and continue to be leaders in this industry,” said Fearon.